As a life-long athlete, I am aware that getting injuries is part of the contract.Eight months ago I suffered a shoulder injury as a result of a five-hour martial arts test. What began as a dull, nagging ache, over time became a consistent, deep pain with tingling in my elbow and fingers. An MRI revealed shoulder impingement syndrome and tendonitis of the shoulder. After nearly three months of conventional therapy (anti-inflammatories, physical therapy, cortisone shots, and massage) I still had chronic pain in the shoulder and extreme muscle tightness in and around the shoulder blade. When a friend suggested consulting Alice Billman and trying Hellerwork, I was initially skeptical because I wrongly assumed it was like traditional massage. However, after only one session with Alice, I noticed a remarkable improvement. During the session I was amazed that Alice was able to quickly locate problematic areas on and around my shoulder that been completely overlooked by physicians, physical therapists, and massage therapists. I left the first session pain-free for the first time in months. In subsequent sessions with Alice, I have consistently had positive results, and learned how Hellerwork leads to long-term pain relief. 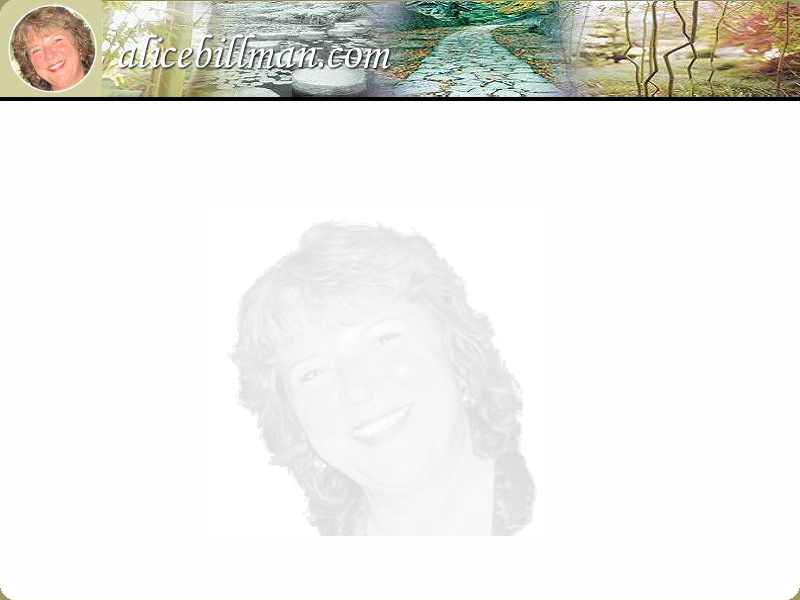 I have found Alice to be professional, knowledgeable, and passionate about healing. I plan to keep working with Alice to insure that my shoulder heals correctly, and to prevent potential future injuries. my body became twisted. I had an invasive surgery that ended up having little effect, and I became resigned to ending up in a wheelchair when my joints gave out from the strain." "Not any more! (Hellerwork) was able in one session to do more than other therapists did in months, and after a few sessions my back became almost entirely straight. Even better, Alice used a systemic view of how my muscles interacted to identify a major root of the problem which my other therapists has discounted." "Alice combines excellent technique with a strong physiological and kinesiological framework. Giving Alice (and Hellerwork) a try has changed my life!" "Almost a year ago, I fell down in an empty swimming pool, my feet flying out from under me while I came crashing down on my shoulders, back and elbows. The pain surfaced almost a year later and started to impact everything that I did. Opening doors, brushing my teeth, picking up the cat; in short almost everything thing that I did with my right arm brought up the pain. Soon this pain was constant, in other words the arm hurt 24/7." "After 3 months of living with this, I called Alice. After two sessions the pain was reduced by 50%. Then I re-injured the arm. No problem, two more sessions and the pain was 75% less. After 5 sessions, I am 99% pain free! And I fully expect to be completely pain free after a few more sessions." "Alice helped improve my posture and my body moved more freely after one session. I was also moved by the way I felt cared for. If there is such a thing as a true healer, I believe she embodies that energy." Thank you , thank you, THANK YOU! I can't believe my own eyes ... my "before" pictures look like someone else! I don't even remember being that rigid looking and slouched at the same time! No wonder I was always unhappy and in pain. My life has changed because of the Hellerwork. I now have a new job and a new love in my life. I don't think I would have changed a THING if it hadn't been for the Hellerwork and Alice. I don't know what I'd do without you! When I first came in to see you, I was in constant pain and could barely manage my day. After completing the Hellerwork series I now hike, swim, run, bike and dance like a teenager. This has been an amazing transformation for me. I can't thank you enough. Anyway, I was in the pigeon pose and it hit me, "HEY! I'm in the pigeon pose! My knee felt so good, I didn't even think about it!" So, I want to keep you abreast of the difference the session with you is still making!!! !